In early April 2012, a video where Girls’ Generation (SNSD) member in embarrassing situation was making the round on Internet. In the short video clip, after another member of Girls’ Generation, Yoona, alighted from the car, she didn’t close the door which located behind Yuri timely. 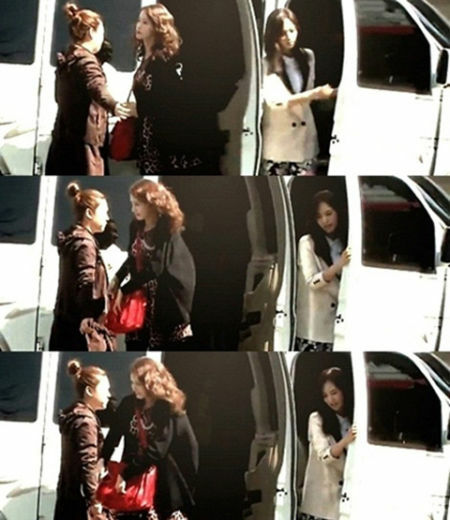 As the result, Yuri who was alighting from the front passenger seat was stuck between the two doors. While Yuri was struggling to free herself, she still looked graceful, very lovely. Netizens who watched the video commented, “Yuri should be very embarrassing”, “This should not be regarded as Yuri embarrassing video,” “The body of Yuri is very soft, should be able to get out easily,” “Yuri looked so cute” and so on. Yuri is starring in SBS TV’s Fashion King in the role of fashion designer Choi Anna.